Super fast with Intelligent Pouch Thickness Detection, this 4 roller laminator does a lot of work for you and delivers spectacular results. It is easy to achieve high productivity with a one minute warm-up time and 39" per minute laminating speed. Visual ready alert and audible ready alert clearly indicate when laminator is set. Automatically able to detect pouch thickness and determine the best settings, this laminator always delivers high quality results. Alternatively, you can also choose settings manually using the interactive user display. The Included Intelligent Jam Alert and Auto Reverse automatically clears jammed pouches barely any user assistance. 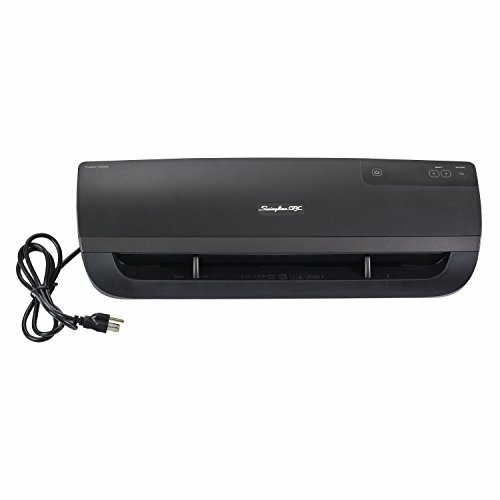 The 5000L is compatible with 3, 5, 7, or 10 mil pouches and laminates documents up to 12" wide. This laminator also includes a cold setting for smooth lamination results with pressure sensitive pouches. Intelligent Power Off activates after 30 minutes of idling. Comes with 50 EZUse laminating pouches to get started right away. Limited 3-year warranty.